Beside the path leading from the car park to the museum. 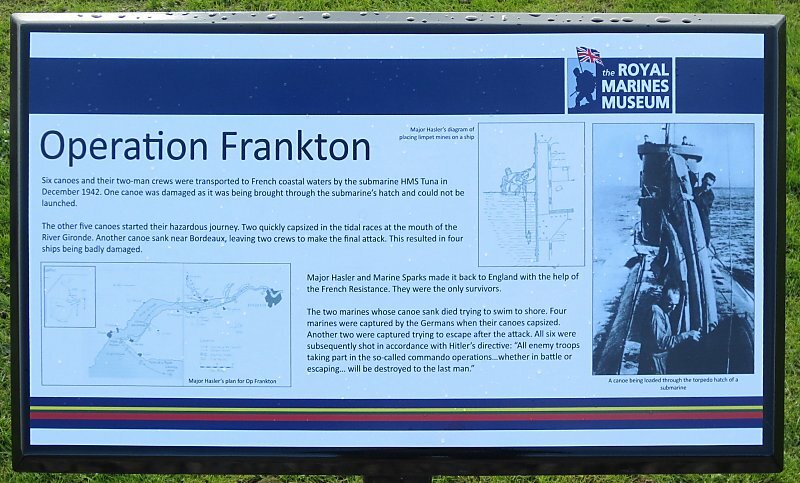 In 1942, Major 'Blondie' Hasler led members of the Royal Marines Boom Patrol Detachment (RMBPD) on Operation Frankton. Their task was to canoe 70 miles up the River Gironde to Bordeaux and use limpet mines to sink a number of cargo ships preparing to take the latest German equipment to Japan. 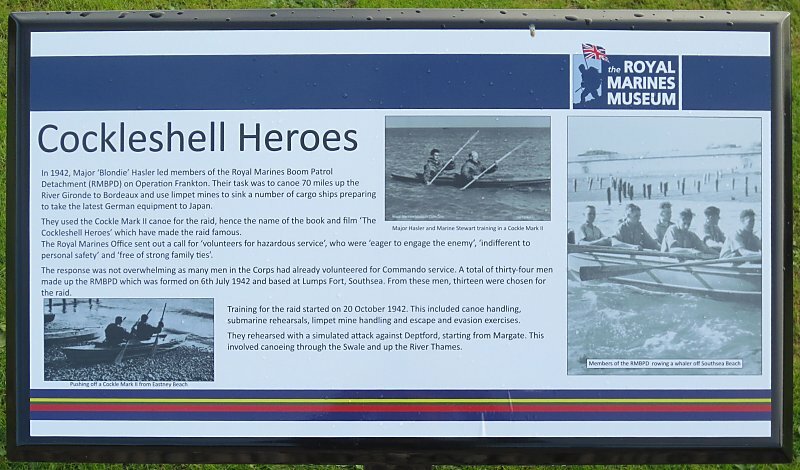 They used the Cockle Mark II canoe for the raid, hence the name of the book and film 'The Cockleshell Heroes' which have made the raid famous. The Royal Marines Office sent out a call for 'volunteers for hazardous service', who were 'eager to engage the enemy', 'indifferent to personal safety' and 'free of strong family ties'. The response was not overwhelming as many men in the Corps had already volunteered for Commando service. A total of thirty-four men made up the RMBPD which was formed on 6th July 1942 and based at Lumps Fort, Southsea. From these men, thirteen were chosen for the raid. Training for the raid started on 20 October 1942. This included canoe handling, submarine rehearsals, limpet mine handling and escape and evasion exercises. They rehearsed with a simulated attack against Deptford, starting from Margate. This involved canoeing through the Swale and up the River Thames. Six canoes and their two-man crews were transported to French coastal waters by the submarine HMS Tuna in December 1942. One canoe was damaged as it was being brought through the submarine's hatch and could not be launched. The other five canoes started their hazardous journey. Two quickly capsized in the tidal races at the mouth of the River Gironde. Another canoe sank near Bordeaux, leaving two crews to make the final attack. This resulted in four ships being badly damaged. 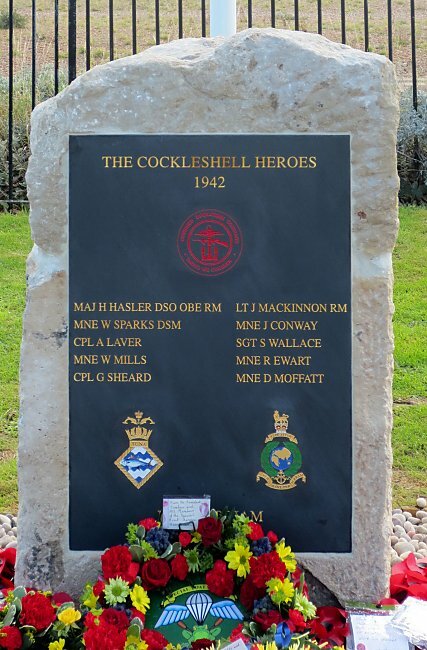 Major Hasler and Marine Sparks made it back to England with the help of the French Resistance. They were the only survivors. The two marines whose canoe sank died trying to swim to shore. Four marines were captured by the Germans when their canoes capsized. Another two were captured trying to escape after the attack. All six were subsequently shot in accordance with Hitler's directive: "All enemy troops taking part in the so-called commando operations...whether in battle or escaping... will be destroyed to the last man." 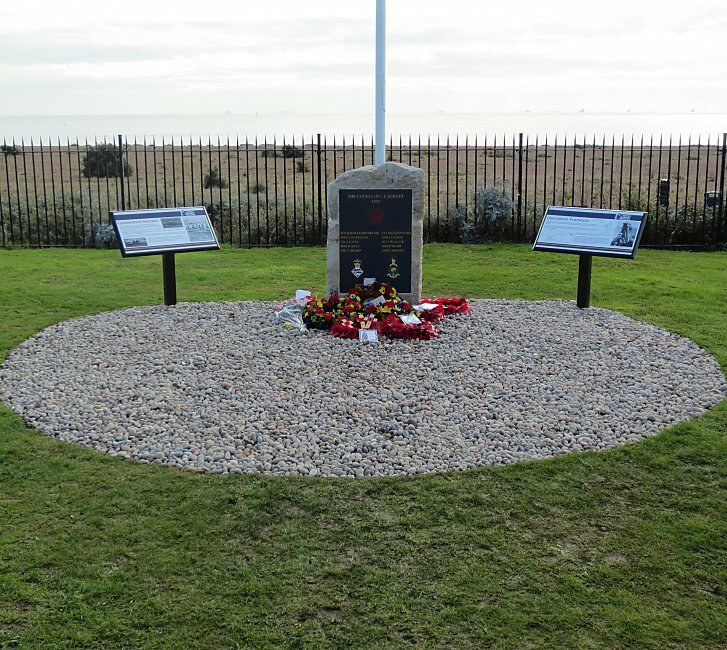 The memorial shown above was unveiled by Lord Paddy Ashdown on 4th November 2012, the 70th anniversary of the raid. 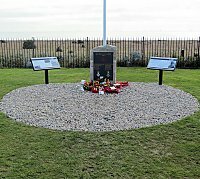 It replaced an earlier memorial board which had stood beside the path to the museum for several years (see left, bottom).